Currently, SAMHSA estimates that 1.7 million American seniors struggle with substance abuse. In 12 years, SAMHSA says there will be 4.7 million. The baby boomers are getting older - and for the first time, addiction treatment programs are responding to the needs of older adults by offering age specific therapy and treatments. SAMHSA, the federal govt. 's substance abuse agency, estimates that by 2020 there will be 4.7 million older drug addicts or alcoholics, almost triple the current estimated 1.7 million. 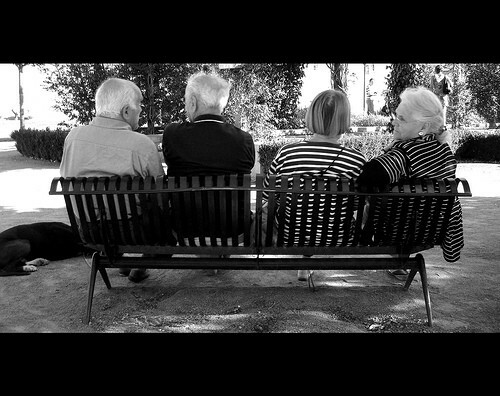 Older adults feel uncomfortable in group settings with younger adults, do not share a kinship or cultural identity with hard living and loud twenty somethings, and aren't easily convinced to open up in front of a group. And so while it's tough to get older adults into treatment, without age appropriate therapy, it's even tougher to keep them there. At the Hanley center, which runs a separate program exclusively for older adults, patient Patrick Gallager, 66, explains the appeal of seniors only programs, "We have different health issues, different emotional issues, different grief issues. We need more peace and quiet and a different pace." And the Hanley center is not alone in offering older adult programming; clinics and residential facilities across the country are discovering the need for age appropriate care, and responding with special track programs for seniors. Odyssey House, a Harlem based non profit, has also opened an older addict segment, and reports that although seniors can be a tough group to get into treatment, once there they tend to be motivated and enthusiastic participants in the recovery process. Older adult addicts abuse alcohol or prescription drugs almost exclusively, and may sometimes have trouble in groups filled with younger illicit drug users. Carol Colleran, a 71 year old addiction counselor at the Hanley Center, explains that the larger the age group "skew" the less older addicts can identify with others in the group, and the less effective the therapy becomes.